Parliament is at its most effective when it is at its least conspicuous – and by that I don’t mean shady gossip in dark corners, but rather the work in committees going line by line through proposed legislation, almost all televised and hardly ever watched. I’m currently serving on two such committees: first there’s a joint committee of both the Lords and the Commons on the Investigatory Powers Bill, which seeks to regulate the surveillance that our intelligence services can use to keep us all safe, and second the forthcoming Energy Bill, which will make wind turbines much harder to build onshore without the permission of local communities and also reform the regulation of the North Sea oil and gas sector. Both of these have the advantage of being deeply relevant to almost all constituents, unlike some more arcane pieces of legislation. And the dilemma in both, too, is similar: how do we balance the national good with the needs of individuals themselves or as a community. For the Investigatory Powers bill, which is being scrutinised in draft form, the committee has heard from MI5, GCHQ, the Home Office and from civil liberties groups such as Liberty and Big Brother Watch; my own view is that we must preserve our right to privacy at all costs, but that’s not the same thing as saying anybody’s right to privacy should trump your right to expect the state to provide a safe society, free from terrorists threats to the greatest possible extent. The Energy Bill is, for me, a rather less difficult balance: the current oil price means Britain has a clear national interest in making sure our own straitened North Sea oil and gas industry is sustainable for the future, and that means a supportive regulatory regime that provides the stability that helps businesses. And it also means delivering the Conservative manifesto commitment to end onshore wind farms unless they have clear community support. 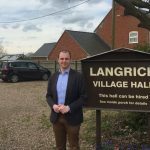 It’s how all these aims are achieved, however, that remains controversial: I expect both these bills to be in the news in the coming weeks and months, and hope that having seen them up close will allow me to best represent the needs of Lincolnshire.